Risk management can be accomplished with your logical thought process! Let's face it, risk is a difficult topic; thinking about things going wrong is stressful! Planning for and handling risks in medical device — including in vitro diagnostics (IVDs) — clinical trials can seem daunting, as there are so many aspects to consider: patient enrollment behind schedule, delays in delivery of study supplies, and much more. The clinical trial manager may also need to participate in product risk management efforts for the device itself, which is part of meeting regulatory and quality requirements for device safety and effectiveness. That process can seem complex to those unfamiliar with it. Risk, in its simplest terms, is the possibility of loss or injury, or, someone or something suggesting a hazard.1 "Risk management" is the process of identifying, evaluating and prioritizing potential hazards (i.e., risks, or things that may go wrong), followed by the application of plans and resources (people and more) to minimize, monitor, and control the likelihood (i.e., probability) of risks occurring, and to minimize the impact of issues (i.e., risks that have occurred). This article explains the basics of project risk management and how to execute it, and the vital role clinical data play in product risk management, so the clinical trial manager can be better prepared to both manage risks in their trial projects and participate more fully in the device's product risk management effort. Risk Management — Why Should We Care? Let's translate that thought process into a risk management framework (Fig. 1). 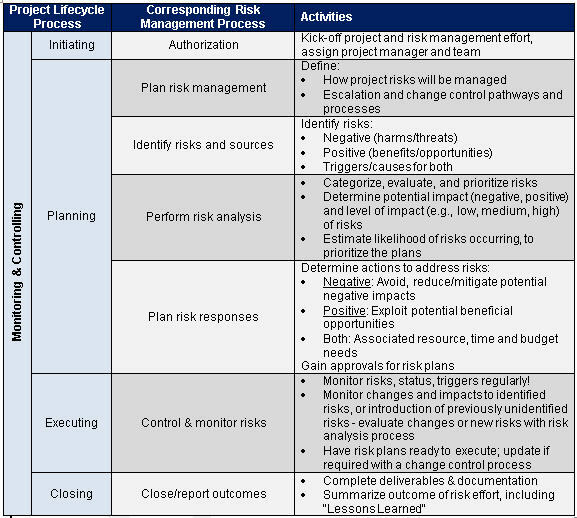 Risk management is a fundamental part of a medical device product's – and a project’s – lifecycle (Table 1), and is grounded in the framework shown above. Like a circle, it is an iterative and ongoing process. The nonprofit Project Management Institute (PMI®)2 provides step-by-step best practice guidance for executing project risk management (Table 2). The project lifecycle process consists of five sub-processes: initiating, planning, executing, monitoring & controlling, and closing. The project risk management processes and activities are listed with their corresponding project lifecycle process. 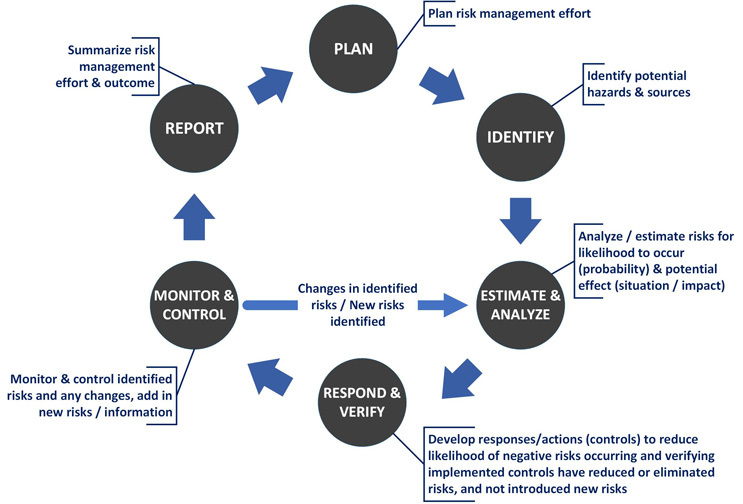 “Monitoring & controlling” can be equated to the “monitor & control” circle in the risk management framework shown in Fig. 1. View project and product risks holistically; discuss them together for a fuller understanding of how product risks could impact project objectives. Risk planning sets a solid foundation for the trial, but is often not initiated, or is not fully completed due to schedule demands. Make time/brainstorm methods to get your team and other stakeholders together to plan — in-person and/or virtually. Ensure scope/requirements are documented — define in-scope vs. out-of-scope — and manage scope to avoid the risks of "scope creep" (i.e., unapproved changes). Adhere to the change control process; ask for information and justifications for requested changes. For issue escalation, ensure team members know to analyze the situation and bring recommended actions/mitigations, impacts, and rationales. We are often so focused on negative risks, it's difficult to think about opportunities to exploit to benefit the project — brainstorm ideas to accelerate schedule, leverage resources, etc. Communicate risk status to stakeholders with dashboards or other easy-to-understand methods. Performing risk analysis for the first time? Keep it Simple! Create a small, color-coded table with a just few categories (Table 3). Plan mitigations in priority order - red zone first, then yellow, then green. Quantify risk impacts with a few tiers/ranges of cost increases, schedule delays, and quality impacts. Based on the medical device type, intended use, and risk classification, clinical trial data may be required as part of design validation, verification of implemented risk mitigations, and to support the analysis and acceptability determination of a device's residual risks (i.e., risks remaining after risk mitigations implementation & verification) vs. its clinical benefits. Clinical data/evidence is part of ongoing risk management activities, required in postmarket surveillance (PMS) studies and in postmarket and/or clinical evaluation report updates. Clinical evidence and risk benefit analyses are also incorporated into regulatory enforcement and compliance decision-making processes for commercialized devices. Integration of clinical data with product risk management is key to the scope and purpose of medical device clinical trials, which require project risk management to ensure the trials meet objectives. The tips in this article can help the clinical trial manager better execute project risk management for their clinical trials, with the aim of providing clinical data meeting pre- and postmarket requirements. 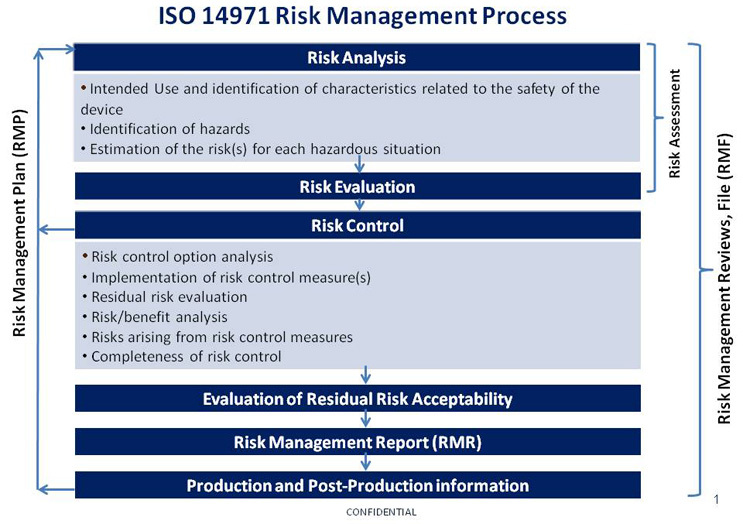 ISO 149714 describes the product risk management process (Fig. 2). It has the same basic elements as project risk management: plan, identify, analyze, control, monitor, and report. However, ISO focuses on causes of — and mitigations for — situations resulting from product hazards that could harm the patient, users, property, or the environment. In the scenario described above, we would start our evaluation by considering the intended use and safety characteristics, as well as potential risks from a variety of sources: design, materials, usability/human factors, biocompatibility, performance, processes, labeling, packaging, instructions for use, cybersecurity, and more. Potential for harm is assessed in terms of severity and probability (likelihood of occurrence). Detectability of hazards or situations may be added to provide additional actionable information to the risk analysis. Risk mitigations (controls) are implemented by the cumulative application of inherent safety by design and protective measures within the device itself, or in its processes. Controls must be evaluated for the introduction of new risks or impact on previously identified risks, and addressed accordingly with the risk analysis process. After verification, the device's residual risks (those remaining after control measures are taken) are weighed against the device's clinical benefits for determination of acceptability. This product risk management process continues for the remainder of the device's post-market life. Clinical trial managers can successfully execute risk management for medical device clinical trial projects by using a logic-guided, step-by-step approach. Risk management is a best practice strategy for meeting project and product objectives for medical devices. 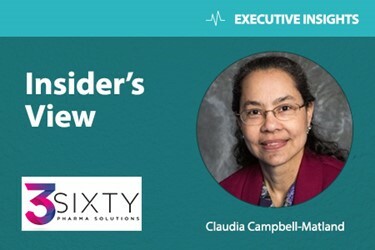 Claudia Campbell-Matland, PMP, is a 3Sixty Pharma Solutions independent Life Sciences Consultant with over 25 years experience in the IVD industry, focused on compliance, R&D, and business development. She is a certified Project Management Professional (PMP®) and Quality System internal auditor. Campbell has managed business-critical programs for the medical device/IVD total product lifecycle, product acquisitions, and remediation of quality system audit deficiencies. She assists start-up and small medical device/IVD companies with project management and compliance services, and aids universities with research commercialization efforts. She is a corporate outreach speaker for PMI-New Jersey Chapter, and teaches university continuing education classes in project management. Campbell received her M.S. in Microbiology at Rutgers University Graduate School / University of Medicine & Dentistry Graduate School of Biomedical Sciences. 3 2018-2020 Strategic Priorities, U.S. Food & Drug Administration, Center for Devices and Radiological Health, January 2018. 5 MEDDEV 2.7/1 Revision 4, 2016, Clinical Evaluation: A Guide for Manufacturers and Notified Bodies under Directives 93/42/EEC and 90/385/EEC. 6 Factors to Consider When Making Benefit-Risk Determinations in Medical Device Premarket Approval and De Novo Classifications, Guidance for Industry and Food and Drug Administration Staff. Issued August 24, 2016. 7 Factors to Consider Regarding Benefit-Risk in Medical Device Product Availability, Compliance, and Enforcement Decisions, Guidance for Industry and Food and Drug Administration Staff. Issued December 27, 2016.